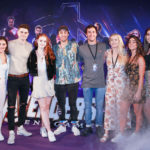 When Oz Comic Con rolls in to Sydney, a wide variety of film and television stars get the chance to visit Australia as part of the convention line-up. More often than not they’re international stars, but funnily enough for the Brisbane and Sydney Oz Comic Con dates this September, Australian actor Nathaniel Buzolic got to come home to Aussie soil. Originally from Punchbowl in Sydney, Buzolic has just recently wrapped up the five season long supernatural drama The Originals. For those of you not familiar with the show, it is centered around the family of the very first vampires, their return to their home city of New Orleans, and their interactions with the many other supernatural beings living there. With the end of the show meaning that Buzolic has a little bit of free time up his sleeve, he took the opportunity to make a return to his own home town, to meet fans and be a part of the Australian pop culture convention scene. In the first part of our chat with Nathaniel, we talk about coming back home to Australia, and what he makes of the The Originals cosplay he sees at conventions. In Part Two, we talk a bit more about his character Kol Mikaelson, how he channelled Tom Hardy to lock down Kol’s accent, and what it’s like getting to be the loose cannon of the family. Nathaniel Buzolic appeared as part of the Oz Comic Con Brisbane and Sydney 2018 guest line up.